Fylde RFC’s nine-match unbeaten run has been halted and now head coach Warren Spragg has challenged his charges to embark on a similar one in order to compete for the National Two North title, starting at home to Tynedale tomorrow. 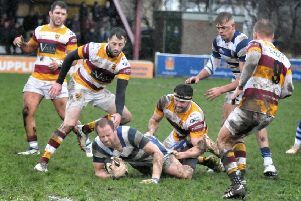 Last Saturday’s 17-12 loss at Sheffield Tigers was Fylde’s first setback since leaders Hull Ionians lowered their colours at the Woodlands in October. The Ionians still have a nine-point advantage over fourth-placed Fylde with 11 to play, though Spragg’s side lost no ground last weekend as the top two also lost. Fylde did, however, concede third spot to Huddersfield, who have a game in hand. Spragg spelled the situation out, telling The Gazette: “To win this league you need 115 points and a team that walks it may get 125 or 130. “Hull are on target to reach 115, and for us to achieve that total, we will have to win every game and pick up a load of bonus points. 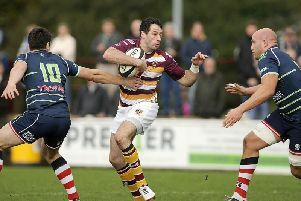 Fylde’s immediate priority is to avoid a repeat of this season’s stickiest patch: in a run of games last autumn, Fylde faced Sheffield, Tynedale, Peterborough and Hinckley in succession and lost three out of four. Last weekend they embarked on the same block of four, when the Tigers completed the double over them, and Spragg knows Fylde’s hopes could quickly be dashed if history continues to repeat itself. Their first task is to avenge the 57-15 defeat at Tynedale, though the north-east visitors have won six of their last eight and comprehensively defeated second-placed Chester 35-5 last Saturday. Lessons must be learned from the defeat at Sheffield, where Fylde had plenty of opportunities but a tight home defence restricted them to a single try until Adam Lewis crossed in the 77th minute. The coach said: “Their tries were opportunistic and we had plenty of possession but just could not get across the line. Conditions may not have encouraged expansive rugby but Spragg added: “Sheffield threw the ball about and it’s about being adaptable. The queue for the treatment table is beginning to shorten at Fylde and Spragg hopes to restore prop Elliot Horner and scrum-half Cameron Crampton to his options for tomorrow. Home supporters could also get their first sight of South African flyer Lex Botha, who made a late cameo at Sheffield last weekend. Spragg added: “It was a nice gentle introduction to English rugby for Lex – playing on the top of a hill in the snow! It wasn’t really an ideal day for him to show what he can do but he did OK.